FROMDOWNTOWN DALLAS: Take I-35 South to HWY67 South to I-20. Take I-20 Westto Main St/Duncanville Rd. exit. Turn left onto Main St, and go 1/2mile to Davis St. Turn right onto Davis St. and then go 100 ft to thenext street, turn right again on Hustead. The house is the 4th one onthe left. 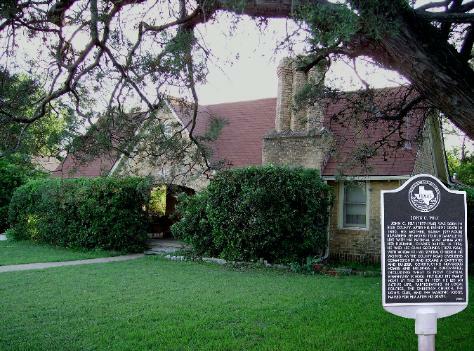 You will see the historical marker in the front yard. FromDFW airport: go South on highway 360 for about 10 minutes to I-20. TakeI-20 East for about 15 minutes to Duncanville. Take the DuncanvilleRoad/Main St. exit and go to the second stop light and turn right onMain St. Drive South for 1/2 mile to Davis St. Turn right on to DavisSt, just go 100 feet to the next right, turn right again onto HusteadSt. The property is the 4th house on the left.